Healthy Summer Cookout tips! It is that time of year when barbecues and pool parties are all the rage. 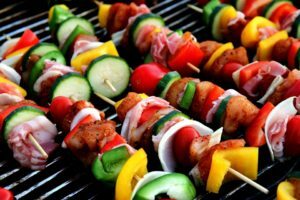 Whether you are the host or guest, keep in mind that while having fun in the sun, you can help prevent most food borne illnesses that can lurk at barbecue parties. 2 Is Your BBQ Healthy? Most food borne illness can stem from bacteria that fester if proper temperature is not maintained in food. In particular, protein rich foods are most vulnerable. Most bacterial like Botulism, E.coli and Salmonella can be a contaminant during handling, cooking and storage of food. Some forms of bacteria like Listeria can multiply in the fridge, while botulism is mostly found in canned foods and E.coli, can thrive in under-cooked foods. 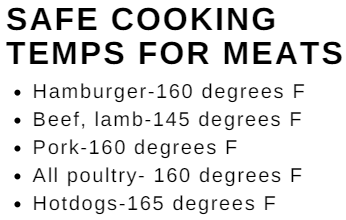 To be on the safe side, take care with the following summer cookout tips to make your summer cookout fun and care free. 3. Use raw meat within one to two days, if frozen 4 to 5 days. 4. Thaw safely: in fridge, in a plastic bag in cold water or microwave. When defrosting in microwave put it immediately on the grill. 5. When marinating, do so in fridge not on kitchen counter. Do not use same marinade on uncooked and cooked food. 6. Keep coolers out of direct sunlight and in the shade, put food and beverages in separate coolers. 8. Never partially grill meats then finish cooking later. 10. Use different utensils for each dish not to cause cross contamination. Use separate utensils and platters for cooked and uncooked foods. 11. Cold foods should not be left at room temperatures for long periods of time. 12. Protein rich foods that are served cold should be kept in fridge until serving time. The most common mistake in food storage during an event is not having proper space to cool and prep food. Several days before the cookout, remove all unnecessary foods from the fridge and freezer, clean and prep coolers and buy ice on the morning of the barbecue. Keep plenty of platters and utensils on hand and heavy duty zip lock bags that prevent leakage. Clean surfaces thoroughly, taking special care with cutting boards. Plastic cutting boards can be placed in dishwasher, while wooden boards should be scrubbed vigorously with hot water, soap or chlorine solution. Most food borne illness will appear from 6 to 24 hours after digestion. Symptoms will include vomiting, diarrhea, headache and nausea. Many strains can become serious and a doctor should be seen immediately. It all sounds very scary but with some active care and prevention, your party will be the talk of the town. Have fun!! !